This version fixes a bug preventing icons to display in the Window submenu. Also significantly speed up recent file icons display when network files are listed. I cannot find the link to update PluginManager entries anymore… what is it? Somehow my older login credentials do not work anymore and I don’t know how to reset the password. Thank you for updating this great plugin. Thank you for this nice plugin. This https://notepad-plus-plus.org/community/topic/13548/menu-icons-plugin-loses-icons-after-opening-a-file issue is not solved with 1v22 unfortunately. Additionally, if switching to command ID match for other languages than English (I moved and renamed the icons files according to the generated list) the icons in the Language, TextFX and Plugins menus are all the same because they all are named -1.ico. Are there any means to have different icons in these menus also with command ID match? 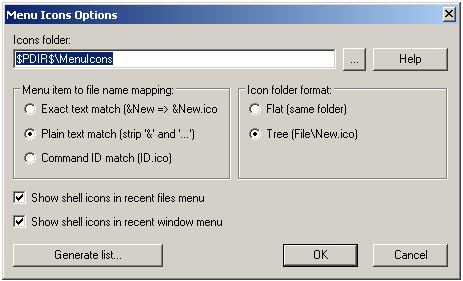 What are the full file paths for the icons for tab and contents context menus (! and @ folders)? I also tried the plain text match with German locale. It doesn’t strip correctly, because there is a **blank **before **… **in the names of menu items. The Menu Icons icon is missing for other languages. I tested the plugin “Menu Icons” and found that as soon as I open a file most of the menu icons are gone. The problem occurs when the Recent Files list is empty and you close a file. The Restore Recent Closed File is dynamically created and now the menu is not what it was on startup (which is the cause to the bug you’ve mentioned). The developer has tried to solve the issue but to no avail. I haven’t tested it now but when the plugin was released I concluded it was better to use Plain Text. I also tried the plain text match with German locale. It doesn’t strip correctly, because there is a **blank **before **… **in the names of menu items. You should modify the MenuIcons file names so that they match with the menu commands in German.xml. Please try the German icon set uploaded in this post. It’s rather old and some file names should probably be updated. Indeed. The @ folder is for the tab’s context-menu and the ! folder is for the editor’s context-menu. @Franco-Stellari250 Should I in the meantime update PM List to version 1.22? I wrote to @Dave-Brotherstone to get in contact with you for the account login. Yaron, thank you for your answer. Here it is exactly the other way round: If there are files in the recent files list and I chose one to open the menu icons disappear. Yes, that is obvious, but If you use the command IDs you can use the icon set for any locale. Thank you for that link. Most files don’t match the current icon set, but I will see what I can use. And the same when opening a file from workspace. I disabled the icons for the recent file list in MenuIcons settings, but that doen’t make a difference. I can not reproduce that. Could you please download a portable NPP (ZIP or 7z) and try MenuIcons with the default settings (i.e. please do not modify anything in NPP nor in MenuIcons)? I only thought the developer might consider this issue for stripping the command/file names. Trimming trailing spaces might be a good idea. The developer’s email appears here. Yes, but what are the folder names if one uses command ID paths (# is 13). Please update here. Thank you.